Three Hurstmere pupils received well-deserved recognition at The Bexley Civic Celebration of Student Achievement. 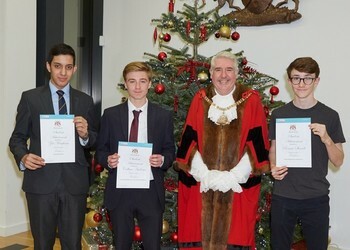 The awards were presented by The Mayor of Bexley at the Council Chambers. Ronnie received the Outstanding Academic Achievement award for his dedicated hard work that helped him to gain brilliant GCSE results. He treated all subjects with equal importance and strived to achieve success. Zal received his award for Outstanding Progress for his consistent hard work throughout his GCSEs and for exceeding his personal targets. His progress throughout Hurstmere was from a high level of effort on his behalf. He treated all subjects with equal importance and strived to achieve success. Callum received the Outstanding Achievement in the Field of Arts or Sports award for being a skilful and competent artist. His progress and commitment were rewarded with an excellent GCSE result. Congratulations to all of our pupils for their commitment and hard work.